I’ve been fortunate to have seen gray whales off the California coast. They are a majestic sight, even from a distance, when they make their annual migration along their regular route between northern feeding grounds and southern breeding havens. There are currently two known populations of gray whales: One on the eastern rim of the Pacific Ocean, a group that is estimated at around 22,000 individuals and migrates between Baja California and Alaska; the other a small group of around 130 that migrates along the western Pacific rim from northern Russia to somewhere Hainan Island off the Chinese coast. Gray whales used to populate the North Atlantic Ocean as well, but the population along the North American coast is assumed to have been hunted to extinction during the 18th century. The existing populations haven’t experienced the kind of migration confusion suffered by some animals due temperature fluctuations and climate change. Until recently. Over the past couple of years, two whales have been spotted in the Atlantic Ocean. One was seen off the coast of Israel. The other, last week, was photographed off the coast of Namibia – the first recorded image of a gray whale in the Southern Atlantic and in the Southern Hemisphere. and another that showed off Israel in 2010. It is being speculated that the whale in Southern Atlantic waters likely got lost while feeding in the normally frozen Northwest Passage. Most of the discussion surrounding an ice-free Northwest Passage has focused on the viability of new shipping routes, the potential for resource exploitation, new areas for tourism. After all, the search for a northerly trading route was a major driver in sea exploration for centuries. With the discovery of these lost whales, attention is beginning to focus on the changes this might bring to a wide variety of animal and plant species. 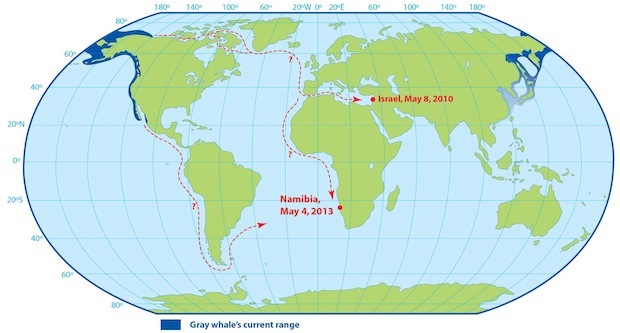 The Passage has been partially ice-free over the past four years, and it’s possible the Namibian gray whale just kept moving east until it reached the Atlantic. It seems unlikely that it will be able to return the way it came. This is probably a sign of things to come. There will be the sudden disappearances, the animals and plants that find new territories. Some creatures will make unexpected appearances, some will get lost. And some will just head south. I’m writing a post about the gray whale in my Korean blog. Your map about possible route of two vagrant gray whales are really good. May I use the map in my post? Yes, of course, but please credit it to Uko Gorter – and thanks for stopping by!